Rhinoplasty is a surgical procedure to reshape the nose. A septoplasty can be done at the same time to open blocked nasal passages due to a deviated septum. You may be asked to provide a picture of the nose shape you desire. You may also be given a book to look through to choose a nose shape. Computer software may be used to simulate desired results. If you are having general anesthesia, do not eat or drink anything for at least 8 hours before the procedure. You may have general or local anesthesia. You will be asleep with general anesthesia. Local anesthesia will numb the area. In this case, you may also be given a sedative to help you relax. The type of anesthesia used will depend on your procedure and general health. The nose will be injected with a numbing medication and epinephrine. The epinephrine will prevent excessive bleeding. An incision will be made either inside the nostril or outside the nostril, across the ridge between the nostrils. The skin will then be lifted off the cartilage of the nose. 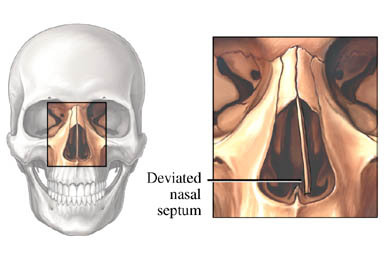 Depending on the desired outcome, some nasal bone may be removed, or fractured and reset to a new shape. Cartilage may also be trimmed. Other techniques involve placement of tissue grafts of bone, cartilage, or mucosa from the patient, a donor, or a synthetic graft. They will be used to help remodel the shape of the nose. For example, the tip of the nose may be narrowed or raised, or the slope of the nose may be reduced or increased. The shape or size of the nostrils may also be changed. When the procedure is finished, the incisions will be closed. The skin will be redraped over the new bone structure. The skin will be tightly taped to keep it in place. A protective metal splint will then be applied on the outside of the nose. It will help to maintain the positioning during healing. Either soft plastic splints or gauze packing coated with petroleum jelly will be used as nasal packs. They may also be inserted into the nostrils as support during healing. You will most likely go home on the same day. Stitches will be removed after the first week. Nasal packing will be removed after 1-2 days. The splint is worn for 1-2 weeks or more. Numbness, swelling, or bruising of the surgical area and around the eyes may occur. Expect swelling and bruising to worsen over the first several days after the surgery. You can also expect some bleeding from the nose, headache, and a feeling of nasal congestion. After the swelling and bruising have lessened, expect full healing in about 3-4 weeks. Nasal surgery. Facial Plastic Surgery—American Academy of Facial Plastic and Reconstructive Surgery website. Available at: http://www.aafprs.org/patient/procedures/rhinoplasty.html. Accessed September 5, 2017. Rhinoplasty. American Society of Plastic Surgeons website. Available at: https://www.plasticsurgery.org/cosmetic-procedures/rhinoplasty. Accessed September 5, 2017.